Success is defined as the achievement of an action within a specified period of time or within a specified parameter. A successful person can be referred to as a person or prosperous person that has gained fame for his favorable outcomes. Success sees no age,location and etcetera. Jealousy is defined as a jealous disposition, attitude, or feeling. A skill destroyed by jealous. Envy is defined as painful or resentful awareness of an advantage enjoyed by another joined with a desire to possess the same advantage. From the foreword, the negative eye browse Razer,has become the precipitate of us pulling our own people down and is why I am writing this article to break out my quietude that has kept Ghanaian Youth down not reaching their fullest potentials. This has to do with the primitive and negative mental imprisonment of us thinking it's not normal for young people to make money!as if,young people are mentally retarded and don't have brains,but young people should make money when they are about to die or going into retirement. Is only in Ghana when a young person is making money,his or her own countrymen and women,Institutions,Media,Police and individuals like the so called politicians,so called Rich men and women, thieves,some unscrupulous unseen faces and forces fight to collapse them which I describe as 'Black PhD'. Is only in Ghana if you are not a Politician,from political Family,from well schooled family,from a Home of already Rich family,from home of Footballers,people don't expect you to be rich and must be poor full throttle which is very unfortunate. It then becomes a crime calling for investigation by some state institutions and so called strong men and women in the country as to how and where you got your money but that's the power of success right there. It's a sick mentality to say the least the way we think in this country. Our thinking is not correct and I'm calling on the Government of Ghana to employ Psychologists in every sector of this country. Is only in Ghana when a young person starts making money,people start tagging and asking... who is he or she? Where is he or she coming from? What is his or her background? What is his or her tribe? What is his or her political party? Who is behind him or her? Who is his or her Father or Mother? Is he or she in Cocaine (White powder) business? Is he or her a Galamseyer? Is he or her a Fraudster or doing Sakawa and what have you? This is sickening and backward in thinking. In this country, we saw how Mr. Asamoah Gyan (Baby Jet) our own beloved Black Stars Captain was enviously attacked and insulted even by some so called learned people just because he was making good money every week in Dubai. All sort of filthy statements to pull him down was applied especially by the media but is the power of success. We seeing how Shatta Wale is being discriminated against and insulted by Young people who don't understand what success is,people go agog seeing that his fan base keeps opening it's tentacles on daily bases. But that's the power of success. People who don't get it right in their sick heads think it's not normal but I put it to them is HARD WORK. We witnessed and heard how 'Ayigbe Edem'is discriminated against because of his location,but the question one should be asking is,Is his location his crime? We see how Noella Wiyaala is discriminated against but yet she from Ghana gets the biggest festivals across the World to play and had also played for the Queen of England. That's the power of success right there. We see how King Ayisoba is discriminated against but yet he plays on Bigger stages abroad. I am taking this opportunity to call on the Tourism Minister Madam Hon. Catherine,her Appointment of Tourism Ambassadors without King Ayisoba isn't complete since the man himself is Tourism and should be added to the Ambassadors. 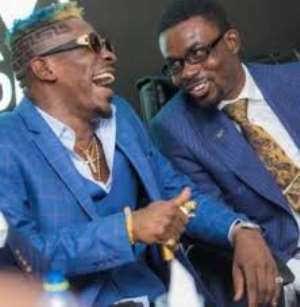 The current person talked about to pull him down is One fine Young Man by name Nana Appiah Mensah the CEO of Zylofon Media,who i think has come to rescue our dying entertainment industry making it vibrant and lucrative for industry players. Let's not forget the story of DKM who some state institutions and politicians got collapsed. But it's sad they don't understand what success is. Let's pray for our Brother Nana Appiah Mensah so that Black PhD isn't applied to him. The aforementioned names of individuals have become successful because they have gained fame for their favorable outcomes. We need to learn from our past and leave behind us all unnecessary battles. Money doesn't see age,location, political party,background and eccetera.